This spacious 1700 square feet condo on the 5th floor has been elegantly and professionally decorated with upscale furniture and accessories throughout—a true “home away from home.” We have painstakingly accounted for every detail and upgraded many features to make your vacation a relaxing and memorable one!! The kitchen is very well-equipped and is complete with a breakfast bar, a large side-by-side refrigerator with filtered ice and chilled water in the door, a radiant smooth-top stove, a microwave, an oven and a dishwasher. Additionally, the kitchen is equipped with many small appliances and upscale utensils, tools and fine dinnerware for your enjoyment and convenience. The spacious living room is comfortable with leather sofas and a reclining, leather swivel-chair to watch a 50-inch Samsung Smart HD TV, a Blue Ray DVD player, a multi- disk CD/DVD player and an amplifier with 5 surround sound speakers. This room also features a full MIRRORED wall, which enhances the beautiful view of the ocean. The private balcony is equipped with a large round resin wicker table, 4 chairs and a resin wicker rocking chair for your comfort and enjoyment while watching the spectacular sunrise or viewing the ocean! The unit has three large bedrooms, each with private access to their own bathrooms. Master bedroom as well as the other bedrooms are equipped with a 32" newest model smart tv with built in web browser. In addition, all the bedrooms have IHome Bluetooth clock radio with USB charging port. Two of the bedrooms are furnished with pillow-top queen sized beds with 3inch memory form for added comfort. The master bedroom has a king-size bed with a 3” memory form topper for ultimate comfort, a large walk-in closet and access to the balcony. The master bathroom has a whirlpool garden tub with a granite surround, an over sized separate shower, a double sink and spacious wood cabinets. We have made MANY DREAM VACATIONS COME TRUE and HOPE to make YOURS A REALITY! NOTE: For all our guests’ comfort, smoking and pets are not permitted in the unit. Crescent Shores does not permit motorcycles or trailers. Please do not remove the rocking chair or the rug placed underneath which will prevent scratch and rust. It was very nice and I would stay there again. Thank you so much for submitting your review. We are so pleased that your stay was pleasant. We would love to have you visit us again. This is by far the most comfortable and well stocked condo we have stayed in. The kitchen has everything needed to prepare meals when you don't want to eat out and the bedrooms are very spacious with very comfortable beds. We had one small problem with an outlet in the kitchen. After a phone call it was repaired within an hour! We would definitely stay here again. Beautiful condo, the furnishings were very nice. The owner provided everything you could possibly need during our stay. We had a wonderful week! Thank you so much for submitting a wonderful review. We are so pleased that you had a great stay at our condo. We strive to maintain our high standard of excellence in every area for the comfort and convenience of our guests! A condo that completes perfectly our visit to the beach ! 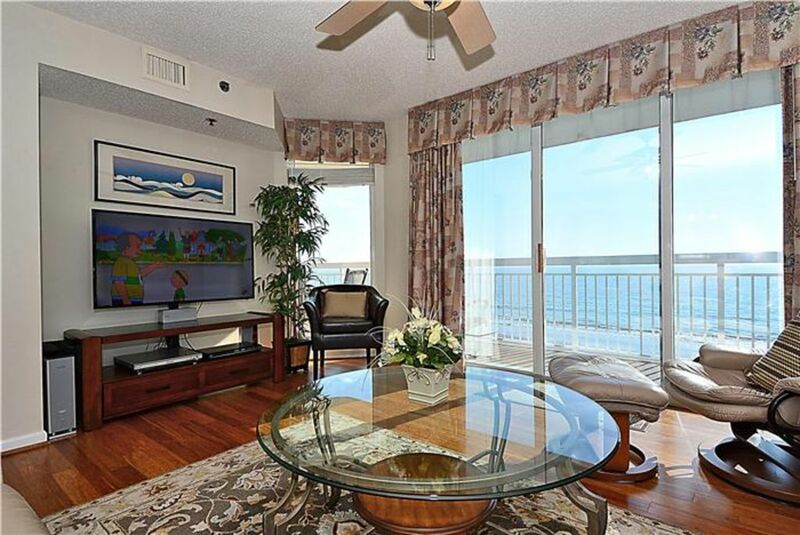 This is a lovely condo, right on the beach and just right for the holiday that you planned for at Myrtle Beach. We have been to this condo repeated times and each time we find enhancements or upgrades that keep it at the top of the line. The building itself is being refurbished (it is only 10 years old) and the unit is always clean and ready when we arrive. The fifth floor view enables us to have a refreshing look at the Ocean yet it is high enough reduce any "crowd noise" from the beach below. A great pick! Sept 23 though Sept. 30, I would rate this Unit 10 + stars. The unit was beautiful. We had 7 in are party and had plenty of room in condo and balcony. The unit was clear and the furnishing, bedding, kitchen was so well stocked with everything that you could possibly need. Could not ask for anything more. We Will be renting this unit again. Just the right amount of space for the 6 of us. Nice sized balcony overlooking the ocean. Would recommend rented an umbrella and 2 chairs for the week. Well stocked and clean. Even had a Magic Bullet mixer for smoothies. Could have used more bars of soap per bathroom to get us started and a bathroom near the pools would have been nice. Also towels provided were similar to ones provided at $49 a night motel. I'd bring my own bath towels. Overall great value. Rates are subject to change until reservation is confirmed. Please call for winter month rates. Departure cleaning and linen fee will be added for monthly rentals. To inquire about any rates not yet posted, please contact the owner.